I woke up feeling much better today! The past few days were terrible, but yesterday it turned around. I was worried I'd have to reschedule my Red Cross CPR/AED/First Aid certification class yesterday, but I felt good enough to go. My current certification expires next week, and I have to keep it current in order to maintain my RRCA running coach certification. It was a long class--five hours! I'm glad to have that taken care of for another two years, though. It's hard to believe that it was already two years ago that I got my running coach certification. This morning, after getting the kids off to school, I went to the rec center to do a deep water run. I had downloaded a bunch of podcasts to my iPod to listen to in the pool, and it really helped make the time go by quickly. I didn't do intervals today--just a steady run, which isn't as effective, but I ran for nearly an hour. I was listening to this podcast called Risk!, which is a storytelling podcast (where real people share real stories, most of which are embarrassing or funny). I was alone in the deep end of the pool, but there were several people in the other end, and there was a lifeguard walking around the perimeter. I burst out laughing (out loud) at least three times while I was running--it was very embarrassing, but the podcast was so funny that I couldn't help it! Every time the lifeguard would walk by, I hid my face under the water because I had this enormous grin, and I must have looked ridiculous. Several people have mentioned the podcast Serial, and how addicting it is, so I listened to the first episode of that last week. It's basically a real-life murder mystery, and this woman tries to solve it. I think I would really like the podcast if there was an actual conclusion, but after I listened to the first episode, I asked my friends about the end. It's left open-ended, so I decided not to listen to any more of it. I hate not knowing the truth! It's like that TV show called Disappeared, where people just vanish into thin air, and they are never heard from again--there is no conclusion, so you're left wondering what happened to them. But anyway, I do love storytelling podcasts, like The Moth, and that's what I've been listening to lately. That will get me through a ton of deep water running! My guess is, it's going to be at least another 3-4 weeks before I can run on ground again. I think we're learning little bits and pieces about his past based on his behavior. (The only thing we knew from the shelter was that he was brought in as a stray, and nobody ever claimed him). He doesn't bark much at all--he'll let out one or two barks if someone comes into the house (when he hears the door open), but that's it. He doesn't bark when he sees or hears other dogs, when people walk past the house, when meeting new people, or anything like that (yay!). But when I was walking him down our street a couple of days ago, our new neighbor (James) was outside talking to another neighbor (Corey), so I stopped to chat. When Joey saw the James, he started barking, backed away from him, and looked scared to death. James was really friendly, and tried coaxing Joey to come over to him, but Joey was freaked out. He went right up to Corey, and let Corey pet all over him, though. So it made me wonder if James just reminded him of his previous owner or someone that was familiar to him? I don't know. Eventually, Joey let James pet him, but he was very cautious about getting close to him. 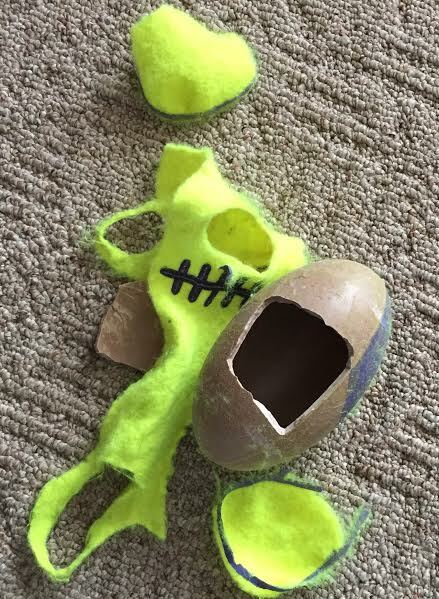 Another clue to his past: Yesterday, he completely tore apart the $16 Kong tennis/football that I'd bought him. I couldn't believe it! Jerry and I were laughing about how quickly he destroyed it, and I gathered up the pieces to put in front of Joey to take a picture (I wanted to show my brother, because his black lab tore his entire house to pieces when he first got her). As soon as I put the pieces in front of Joey, he looked broken--his ears and tail dropped, and he ran and cowered like he was terrified that I was going to hit him or something. I felt awful! So I think he probably used to get punished for chewing things. I had to explain to the kids and Jerry how to do it, so that we're all on the same page, and so far, it's worked wonderfully. Joey has learned the following commands: sit, stay, come, drop it, leave it, bring me your ball, down, and back off. And that's within a week! I think the positive reinforcement is good for him, especially considering he seems scared of certain things. The kids absolutely adore him. Today, Eli was spinning a top on the kitchen floor, and Joey was so curious about it. He kept sneaking up to and trying to tap it with his paw (much like a cat would do) and Eli was cracking up. The kids love that Joey comes to them when they call him, because the cats would never do that (they usually come when I call them, but when the kids do). I really wish I could get Joey to sleep with them, but he always ends up on my bed. But anyway--that's the update. We've only had him a week, but I'm so happy with how well it's all going! Try this bone, it's the only toy my puppy hasn't been able to destroy! Next time your cpr comes due, look for a challenge class. It's basically a skills check off and much quicker than taking it completely over again. I like joey! he seems so sweet. I have a rescue too that doesn't bark much. I think joey is braver than my dog actually. Glad its working out so well! It sounds like you are doing all the right things with Joey. It's always sad when their past is a bit mysterious, but you can tell there was abuse involved. We think our greyhound got hit at the track. She gets very scared when we pick up a broom or our Swiffer, so we think she got hit with a stick. Breaks my heart even thinking about it. I'm learning about that danger with podcasts too! I just started listening to podcasts on my long runs, and on Sunday, I was listening to Wait Wait Don't Tell Me, and starting laughing out loud right as a bicyclist passed me. I saw him turn his head as he got in front of me, I couldn't really see his face but I'm sure he was thinking WTF! It doesn't surprise me that he wants to sleep by you. Our dog did the same thing. She was also a rescued black lab-border collie mix. My mom and dad went to look at her at the shelter (which I didn't know about) and the next day mom took me on a surprise errand to go get her. 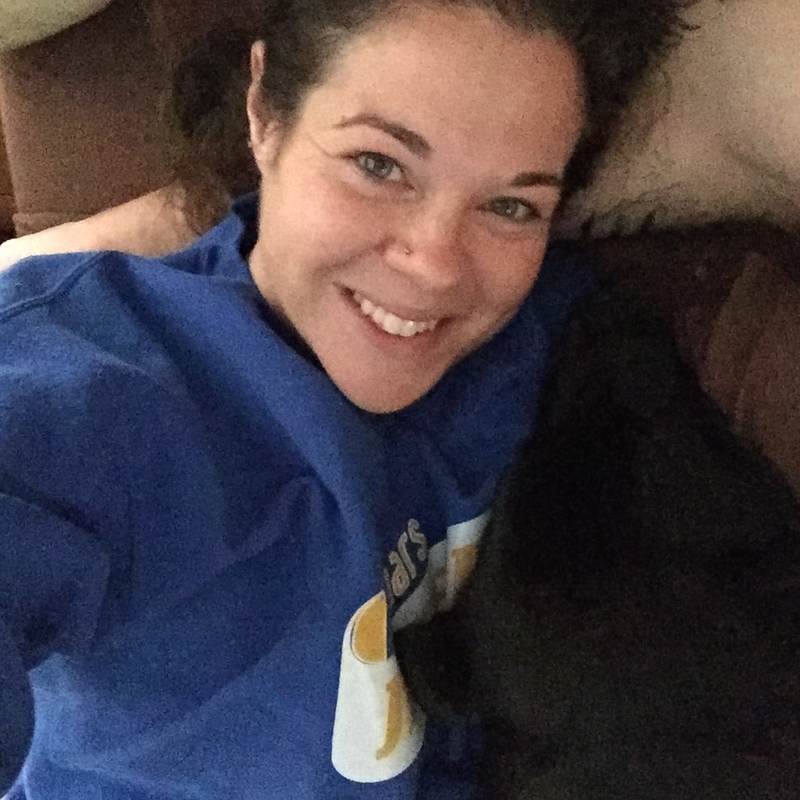 She was the runt of the litter and scared to come out of her cage, but when she recognized mom's scent she stuck to mom like a fuzzy black burr. We got her at about 2 months old and lived to be about 16. Until the day she died, she was mom's dog. She adored dad and I, but if mom was in the room - she was mom's. You rescued Joey. You are his. Joey is so cute! I know what you mean about no endings, but Serial is really great - and the person in question was now granted a request for an appeal, so the story continues in real life. My Samoyed destroys all toys, but we've had the best luck with Tuffy Toys (only the ones they have marked 10/10 for toughness!). I've listened to podcasts for years, but Serial really lit a podcast fire in me and it's actually nice because instead of finding myself on the couch, procrastinating and/or munching mindlessly, I'll put on a podcast and binge listen while working on other things. I love the Moth and all real life storytelling type podcasts too. While trying to find more I discovered that if you are in itunes on your desktop (not on the app) and you look at the shop page for a podcast you really like, there will be more listed below that "people that liked this, also listen to this" and I've found so many more that I love that way. Strangers, Invisibilia, Criminal, and of course old favorites include This American Life, StoryCorps, State of the ReUnion, Unfictional and Snap Judgement. And I love the Joey updates! We have two cats and my fiance is 100% a cat man, but I've always loved all animals. We'd have a dog if he'd let me... and a rabbit, and a bird, and hamsters, and fish tanks, and on and on and on. He seems to be adjusting so well! I have to laugh about the toy destruction - my sister and her fiance adopted last year and I have spent some weekends puppy sitting. They warned me about his powers of destruction but I learned the hard way when I folded my legs on my chair and quite literally 30 seconds later my sandal on the floor was torn apart! He is a lot better now but he definitely is a little devil! The only toys mine doesn't destroy are the hard plastic Kong toys. He's not allowed anything else anymore. Wondering if the friend he shied away from had facial hair. Dogs, like babies, notice facial hair and glasses and hats and such. So, if he was abused by someone with a full beard, he may shy away from those with full beards. Just a thought. It sounds like you got a great dog! Hopefully he learns that his new home is loving and he doesn't have to be scared. He sounds like such a sweetie! Aw, poor Joey. Our family dog was the same way, nervous, especially around men with beards. He was a rescue and also had a few small scars on his nose. One day about 2 weeks after we got him, my dad took him to a community centre and he got scared when some chairs fell and ran out the door. He was lost for 3 days before we managed to find him. Luckily we then had him for about 13 years. Just wanted to warn you that Joey might react similarly when scared in the beginning, so this doesn't happen to you guys! So glad Joey found his "forever home" with your family. All of our pets have been rescues of one sort or another. One of the cats we got from a shelter had been adopted but "returned." Whatever happened to him in that home must have been pretty traumatic, as he hid from everyone but me for about 3 years. I'm just glad that the fact mily brought him back to the shelter, as I had about 14 wonderful years with him. Lady Amber (above) is right, though. Animals know who "saved" them. Your Joey looks and acts almost exactly like our dog. We got him from our local shelter when he was a few months old. He is black with brown highlights and dark spots on his tongue. Not one problem since we got him. He is smarter than we will ever be. He was supposed to be my husband's dog, but he spends 90% of his time next to me. I love that I found your blog (through Pinterest)! Can't wait to meet Joey in May!